No matter the fashion trend of the hour, the basic cotton t-shirt is a staple that is here to stay. What makes these cotton tees so essential to our routines? Cotton shirts breathe better than clothing made with synthetic materials, and are less prone to retaining odors and losing shape. Even better — cotton t-shirts are low maintenance and don’t have a ton of washing instructions. It’s a soft, familiar fabric that everyone can believe in. Go with cotton for a natural, classic clothing choice. 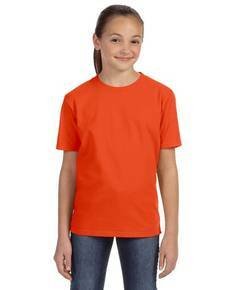 We offer a wide variety of cotton t-shirts from leading brands such as Fruit of the Loom, Hanes, New Balance and more. Browse 100% cotton shirts in men, women and youth sizes alike. You’ll find tees in every color imaginable and at the lowest possible prices. At ShirtSpace, we’ve made sure that here, there’s something for everyone. Our cotton t-shirts come in popular styles such as the crew neck, v-neck, scoop neck, long sleeve and more. Stocking up on durable cotton shirts is a great way to reinvigorate your wardrobe. Choose tees for your next workout or workday — you’ll find that we have options for every occasion. Wear your blank cotton tees as they are or add some personal touches with your own designs. Cotton tees are standard choices for screen printers and graphic designers — what better way to promote your work than with a universally recognized fashion staple? Try cotton tees for a guaranteed hit, whether you’re making tees to sell or to give away to the masses.